You can pin me to your Pinterest board. 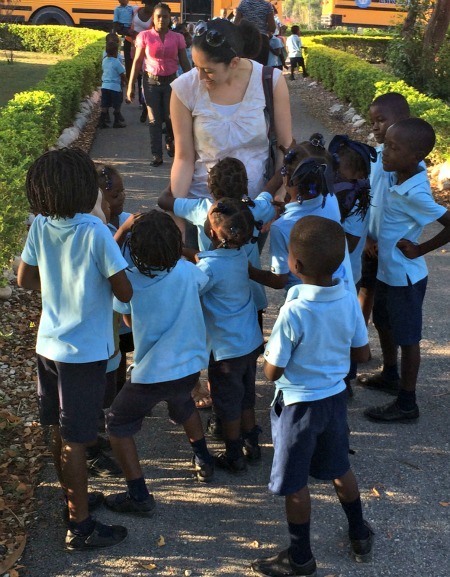 After spending a few days in Haiti as part of a group of teachers working in partnership with a privately funded school there, I wanted to reflect on the experience. 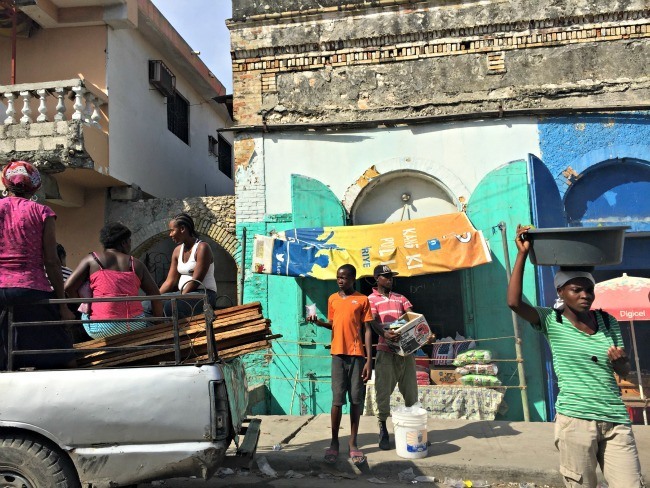 An understatement indeed, but Haiti is not the typical Caribbean destination of choice, but rather, the poorest nation in the Western Hemisphere. I was certainly aware to some degree of what I’d be seeing. I’ve traveled to parts of Southeast Asia and Central and South America, where the living conditions are less than optimal. However, from my first steps out of the Port au Prince Airport, nothing quite readied me for the divide between the world I’d come from and the one in which I’d arrived. Port au Prince is nothing like the photos of Haiti’s beaches at Labadee or the UNESCO World Heritage Citadel and Palace near Cap Haitïen. The city streets are chaotic, lined with trash, and can seem lawless. The streets are very busy. People, vehicles, and animals fill the streets. As I considered my thoughts and feelings about my time in Haiti, it felt phony to rattle on about realizations of how “rich” I am compared to the people whose lives I glimpsed or how grateful I am for things like safety, freedom, and privilege. I’ve lived and traveled enough to recognize already how fortunate I am to have these things. My gratitude is ever-present and I didn’t want the sum of my reflections about Haiti to be about my own personal growth. 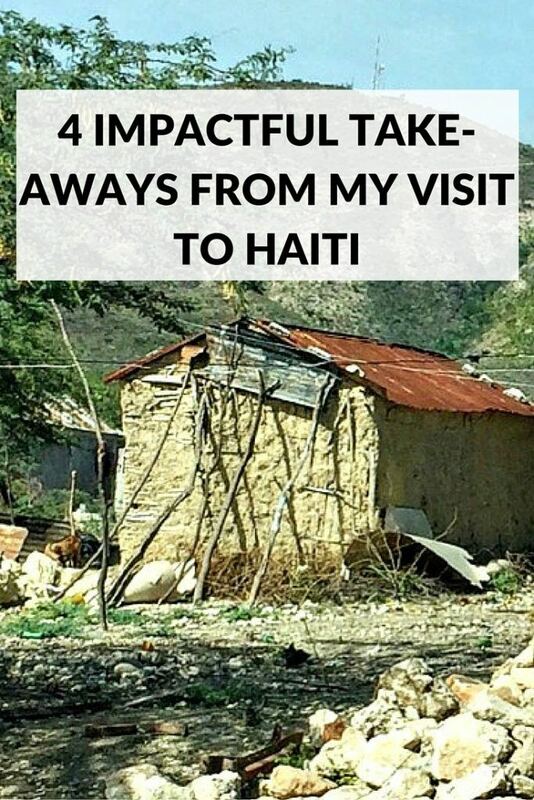 It’s only natural my mind was consumed with all kinds of thoughts as I took in the scenes of daily life around me, but with time to sort through my experiences, I’d like to share with you 4 impactful takeaways from my visit to Haiti. It can be shocking to see firsthand how a country with a broken government looks. Government is supposed to protect and provide secure access to people’s basic needs. 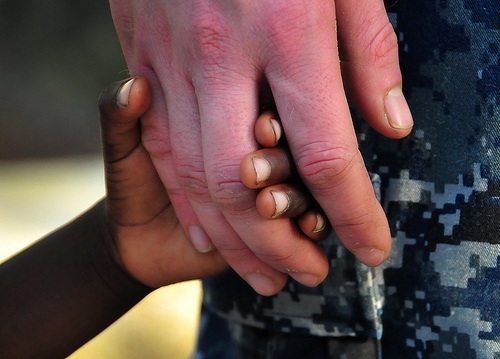 Yet, after just a short time in Haiti, you quickly understand what a privilege this is. When decades of corrupt leaders steal hundreds of millions of dollars from their people, the result can only be utter devastation in the places where government programs and infrastructure should be. Roughly 60% of people in Haiti are living below the international poverty line of less than $1.25 per day(!!!) and the government is unable to offer widespread assistance. Extreme poverty shows itself in the tattered clothing worn by children, the houses made of mud, straw, and scrap metal roofs, and the despondent looks clouding the faces of many as they stare from their homes and go about the day. Garbage is everywhere. Piles of it are strewn along the streets, outside of houses, and filling communities and cities. In the seemingly lawless capital city of Port au Prince, heaps of garbage burned unattended along the roadside. I felt both admiration and heartbreak watching a boy pull a string attached to a toy car he had made from a plastic water bottle and other garbage remnants. Stations for the kids to wash their hands were in several places within the school compound where I visited. Water is a basic need, and yet over 40% of people in Haiti don’t have access to drinkable water and nearly 80% of people don’t have access to a sanitary toilet. 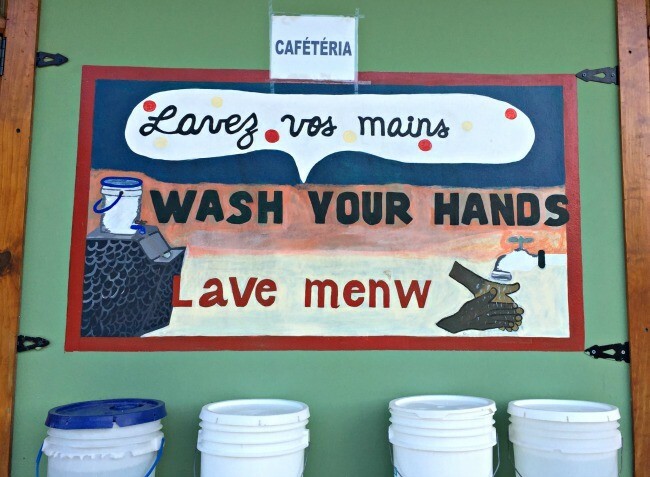 At the school where I worked, signs warned in Haitian Creole, French, and English to use the chlorine-treated water to wash your hands in order to prevent the spread of Cholera and other diseases. When the children arrived at school each day, the first order of business was not math or reading, but rather going to the bathroom, washing their hands, and eating the hot breakfast awaiting them. 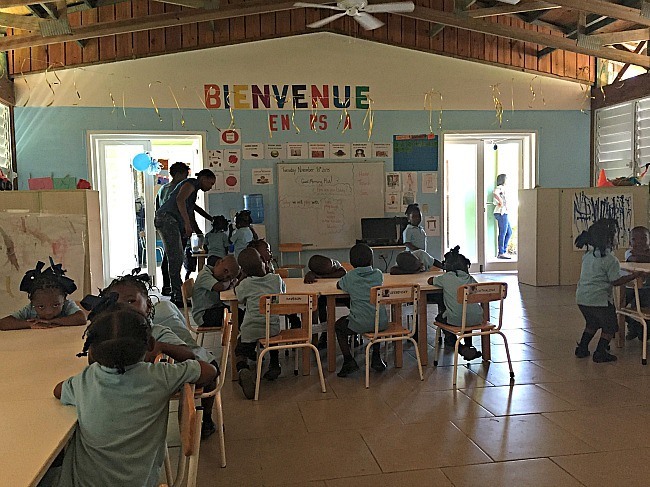 A 1st-grade classroom in a Haitian School. Only a chalkboard hangs on the wall. This is a stark contrast to the well-equipped, privately funded school across the street. Even though it should be a basic human right, the Haitian government is unable to provide free public education to all. With only 3%-10% of the federal government’s budget allocated for education, the burden of tuition and school uniform fees falls on families who struggle to pay or simply cannot afford it. Private funding and charity groups have helped in boosting the percentage of primary age kids attending school to near 75%, but this falls sharply with just 20-25% of children continuing on to High School. 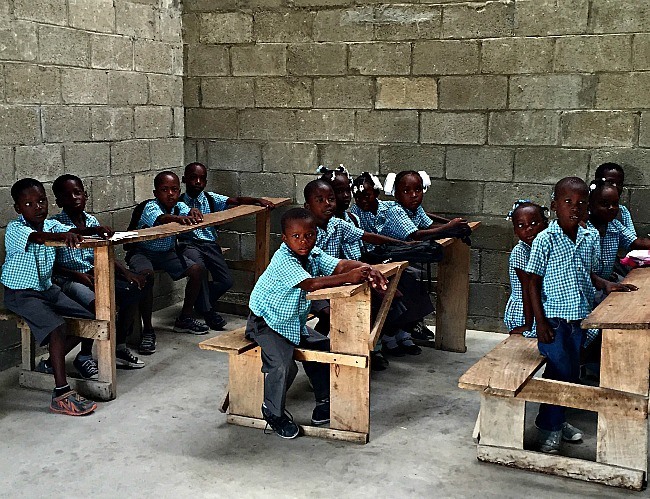 Teachers are largely untrained and more than a third of Haitians are illiterate. Do you notice the difference in this classroom compared to the one above? These kids are lucky to have been chosen for the 50 available spots each year out of a pool of 1000s of applicants. As a teacher though, my thoughts go to the kids who don’t attend school and the kind of future that awaits them. The electric utility is nearly nonexistent in Haiti with only around 12.5% of people having regular, legal access to electricity. No electricity goes beyond just pitch black streets and boredom. After dark, people can’t read or otherwise educate themselves. Hospitals may not have necessary treatments that require refrigeration. With only their immediate surroundings at their disposal, children can’t benefit from the broader exposure things like the internet, movies, and even TV can provide. Looking at a night view of the island, Haiti is on the left and the Dominican Republic is on the right. Other than Port au Prince on the Haiti side, few lights can be seen. It’s vital to be in the moment, especially when something is uncomfortable. Slipping through the ramshackle stone and metal wall to enter the Pont Leocan community, just across from the private school gates, I was momentarily disoriented. Amidst the dry, rocky landscape are tiny houses made from scrap metal, plastic tarps, and a mortar-like mixture of mud and straw, as well as a few people with houses made of cinder blocks. There is no water. There is no electricity. No one has shoes. The children wear a top or a bottom. The conditions immediately teach the difference between poor and poverty. A house made of mud and straw with a scrap metal roof. I tell myself to refocus. See the old woman who’s smiling her friendly, toothless grin and wrapping her arms around you. Engage with the excited children who are (literally) hanging off of you and want you to jump and play with them. Make eye contact and think only of this moment and then the next. These are people who are both happy and curious to see you. These are some of the most precious moments from my time in Haiti. It’s flattering to stand out because of how you look every once in a while, but distressing if it’s your daily experience. Not only did I look different to the children living in Pont Leocan, I was a total sideshow. Those who were more outgoing crowded around to hold my hand, touch my clothes, even feel my cheeks and tug at my hair. Other children were interested in who I was, but cautiously kept their distance, used a stick to touch the backs of my legs, or waited to finally build up the courage before touching my skin. One small baby being held by her mother screamed any time her mom leaned her toward me. It makes sense that some of the not yet school-aged children hadn’t seen many (if any) people with a skin color as light as mine. But, how would it feel day after day to be on display because of a physical attribute or an appearance that’s different from everyone else around you? Even though it’s easy to say we can imagine how that would feel, it resonates differently when you’re actually in an experience where you are the exhibit. Arriving at school in the morning, I am immediately surrounded. Human beings have incredible strength and resolve. The children at school wanted to play. They sought out the teachers’ attention. There were children who helped their friends on a class project and others who cut the line or tattled on someone else. They enjoyed music, storytelling, and recess. It was easy to get caught up in the day and for a moment forget what was beyond the school gates because these kids were just being kids. Riding the school bus in the early morning hours into Saint-Marc, a woman sat on her front porch combing her daughter’s hair. The crowded streets were busy with honking motorbikes and people interacting and trying to sell their goods. All across the island of Haiti, there’s so much more than what meets the eye. Daily life keeps moving and the people I saw displayed an incredible will to continue on even in the face of the direst circumstances imaginable. It’s impossible to not come away feeling awed at such resilience. What do you think of these takeaways? Have you visited a developing country? What were your takeaways? Like this post? 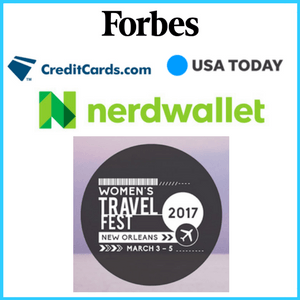 I’d love for you to share it with your social media followers using the share buttons below! Hit the Independence Day Trail! Such kind words! Thank you. I’m glad you were moved by the post, Gary. This is exactly how I feel about the Philippines sometimes, and you’ve worded it so beautifully. Thanks, Erica. I appreciate it. It is indeed heart breaking to see a country that suffers great poverty. But its amazing to see how people can cope in such sircumstances. Both are so true… It seems such an unlikely mix of feelings to have at the same time, heart break and admiration, right? In the city we’re living in in China we also get a lot of stares and the children always trying to touch our faces, our hair and our hands. There’s always teenagers taking sneaking photos and older men staring as they whiz past us on their bikes. Its definitely a weird feeling when you’re, as you say, a walking side show. Thanks for sharing, Lexi. I can totally relate to your experience. It’s so great that there are people in the world who are volunteering there and trying to help out. They need compassionate people like you! Thank you, Laura. I was so impressed by the people who have moved there from places like Canada and the U.S. and are working to make a difference. It was so inspiring. 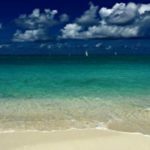 beautifull written with intelligent insight, I really enjoyed this post and want to go to Haiti now! Thank you, Hannah. I’m so glad you felt inspired! What an amazing post. It must have really tugged at your heart strings as a teacher? Thank you, Fiona. Oh yes, as a teacher and a human being, it was impossible to not feel heartbreak and helplessness, but also such admiration at their resilience. Very moving. A beautiful piece about the human condition. Thank you so much, Megan. Very interesting, I didn’t know only 50 out of a thousand or so are able to attend a nice private school. I was also unaware as to how much of the island doesn’t have electricity. Each school has its own admission capacity, Holly. The school I partnered with can only admit 50 students each year, despite the incredible need to admit more children. This article was really eye-opening and informative. While I’m sure it was a life changing experience, I appreciate the fact that you made the post about Haiti and not about you. So many people do that and there’s absolutely nothing wrong with it, but this was just so insightful! I had no idea what level of poverty existed in Haiti, and I’m glad I do now. The light comparison between the DR and Haiti is unbelievable! I really enjoyed your writing style as well! Thank you, Francesca. It was life changing and I struggled for a bit on how to word my experience. As for the lights, when you are there and the streets are pitch black, not only from no street lights, but also from houses not having any electricity, it can be quite an incredible realization. 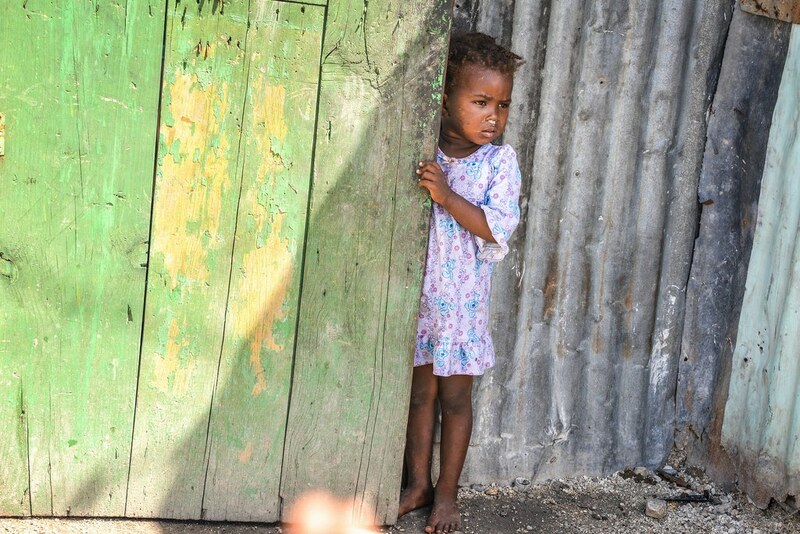 It breaks your heart to see how much poverty is in Haiti. It’s impossible not be compassionate when you see all those innocent children suffering and that beautiful country coming apart. Very beautiful post! There is such hope in the faces of the children, Anda. It’s impossible not to show compassion, but also admire their strength and innocence. Wonderful insightful post. I’ve heard from other people how wonderful Haiti is, and the way you portray is so honest and sincere. 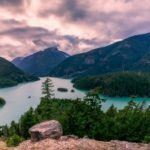 You have a great blog that breathes authenticity. Thanks so much, Carol. I appreciate you taking the time to read my posts. The spirit of Haiti’s people is truly inspiring and so moving. 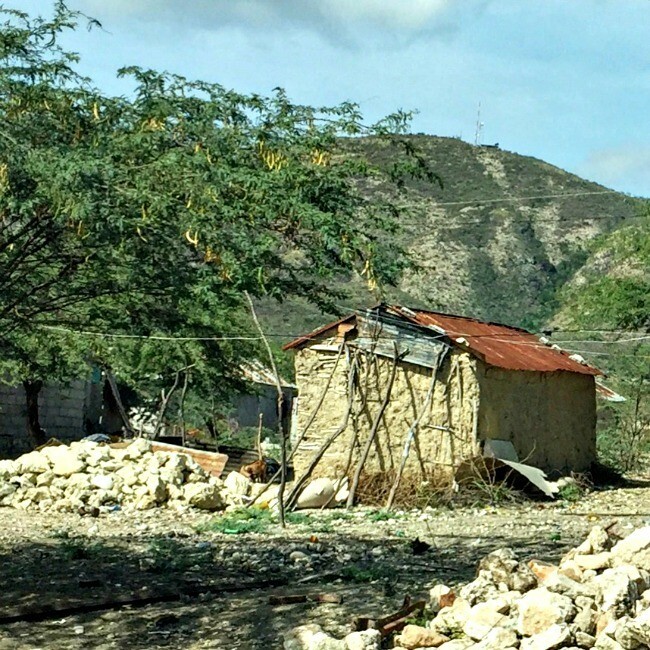 It’s sobering to see the conditions in Haiti. I knew that conditions were bad in Haiti but did not realize the extent of the poverty and lack of basic needs. It is deplorable what the govn’t has done to its people. I agree, Rob. It’s happened over time, with corrupt political leaders who have stolen so much money from the government. I’m glad the post was informative for you. I really enjoyed reading your words, very nicely written! Very engaging to the reader.and I was very much drawn in! Thanks for sharing your time with us from your trip to Haiti. Thank you, Alli. Glad to know you were moved by the post. It was such an impactful trip! Haiti has had a tremendous amount of tragedy. My hope is that with people like you visiting, and talking about what they see others will be moved to help. Your story was well told, and wide reaching. Keep up the good work. Thanks for the kind words, John. There are so many heartbreaking scenes and moments in Haiti. It was important for me to share because, unfortunately, we hear so little about this impoverished country and its people. Having been on two mission trips to Haiti, and seeing the best and the worst of Haiti, I understand what you have written about. We provided everything from Pastoral training to health check-ups for the kids at the mission school there. We were shocked when we were handing out popcorn, to the over 30 kids, as a treat. Unlike American kids, who have no concept of waiting for everyone to get their food, all of these kids from first to last, took their food to the table. Then they sat and waited for all the other kids to get their popcorn and be seated. Then, no one ate a single kernel until they had prayer to give thanks for this “special” blessing. I have never seen such selflessness anywhere in the 46 states I have been to in the US. 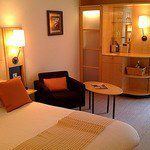 Did you have the chance to visit City Soleil? It is truly the worst hell in Haiti. The mud home you showed above is absolute luxury compared to City Soleil. There, not just garbage, but open sewage flows through the streets. Their house are usually made of cardboard. Some lucky ones have something akin to hard cardboard. The really lucky ones have Tin homes. The people there are so numerous, they have to sleep in 8 hour shifts. Entire families, as many as 10 in a family, trying to sleep in an 8×5 and usually smaller place. The other 16 hours are spent simply sitting on the ground or walking around. 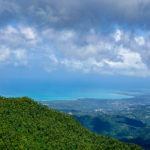 Haiti is unlike any other country in the world. The depth of poverty and dire circumstances are unmatched even in Africa. I would make one last comment. You must have been incredibly brave, or… to be walking around holding hands with the kids with your fingers so cracked and near bleeding. Was it from working with your hands, or the constant scrubbing with alcohol that caused it? I so appreciate what you have done and what you have gone through. I especially appreciate your sharing this experience. Today, over 25 years later, I am absolutely revolted at how adults and kids in civilized countries all over the world waste food. Thank you for sharing your experience, Rick. I did not make it to City Soleil. It certainly sounds even worse from where I was, which is quite difficult to imagine. When you visit a country as poor as Haiti, it definitely changes your perspective on how you view the actions of others in developed countries. We have so much to be grateful for. It’s something we hear and say, but don’t always recognize how true it is. this topic, it may not be a taboo subject, but usually folks don’t talk about these issues. Thanks for your kind words. I’m glad you found the post interesting. Jackie, I enjoyed your article. I’ve been to Haiti twice and hope to keep going. Fell in love with the people and the country. Yes they are so resilient and thankful for the little things. The kids want to be loved and held so much. I think another contributing factor to the poverty, in addition to corrupt leaders, is that they have historically been taken advantage of and mistreated by other countries. They had to ‘buy’ their freedom first with their blood and later with hundreds of millions of dollars. Anyway, thanks again for your article! Thanks so much for reading, Kim. I totally agree with you. 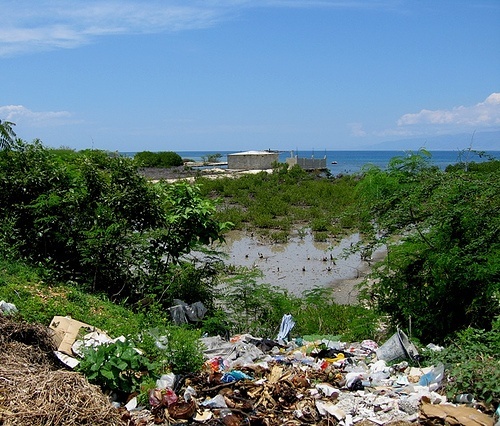 It’s certainly a few factors that have largely contributed to Haiti’s plight. I appreciate you adding your thoughts. Hello Jackie, I want to visit Haiti, but,I am not sure if it is still accessible after the recent devastation – what do you think? My plan is to visit before or after Dominican Republic. Thanks for sharing your story. I am currently teaching in Colombia. Good luck wherever you are at the moment. Thanks for reading, Jonathan. It’s so hard to say, but given there was just an earthquake this weekend, I might wait to see what the next short bit of time brings. If you were there during a natural disaster, it could be all but impossible to leave/evacuate for a while. 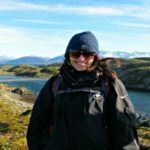 Best of luck with your teaching in Colombia and your travels. 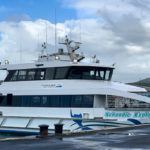 If you do decide to visit, check back in if you can with an update. I enjoyed reading about your journey. I have a trip planned there with my church in about three weeks. I wanted to know what the country was like and what to expect. I will ask more questions after reading your article.